Green Monday, also known as Clean Monday, marks the beginning of Lent (50 days before Greek Orthodox Easter) and is celebrated island-wide. It follows ‘Cheesefare Sunday’, the last day one can eat eggs or dairy products before Lent begins; for the same reason that in England Shrove Tuesday is sometimes called Pancake Day - one makes pancakes to use up all the eggs and butter before Lent. Easter being such a moveable feast, Clean Monday may well occur early in February or towards the end of March, which can make the weather for the holiday somewhat variable. No matter when, the day is filled with an infectious carnival spirit and children are given free rein to dress up and go visiting. Traditionally they should make Kyria Sarakosti (Lady Lent), a paper doll with seven legs to represent the seven weeks of Lent; every week, a leg is cut off to show how many weeks remain until Easter. Green Monday is a time for family gatherings, frequently with an alfresco picnic, and folk take off for the beach or the hills to fly kites, often not very successfully! Village telegraph wires become kite graveyards for a week or so afterwards and power cuts are not uncommon. 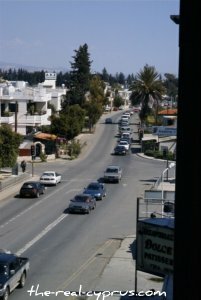 Anyone who has lived in Cyprus for any time at all will know how central food and eating is to the Cypriot character. Feasting or fasting, there will always be a recipe handed down for generations, a tradition of particular festive fare or simply a favourite dish that yaiya (grandmother) has always made which cannot be bettered. Cyprus foods can be divided into nistissima – fasting dishes – and millomena – fat dishes. Foods during the seven weeks of Lent are fixed according to lenten restrictions, which means no meat or fish except for seafood like calamari, cuttlefish, prawns or octopus; nothing derived from animals or fish with red blood , so no milk, cheese, yogurt or eggs. The first week of Lent is supposed to be the strictest fast of all -- xerophagy, as the Greeks say; dry eating, nuts and twigs, so the feasting on Green Monday sometimes reaches epic proportions, whilst still observing all the rules. Little phyllo pastries like tahinopitta (with sweetened tahini paste inside), spanokopitta (spinach) and kolokopitta (pumpkin with raisin) are much prized and, as phyllo is made with olive oil not animal fat, it can be used in all manner of innovative ways for picnics, both savoury and sweet. An absolute ‘must’ is koulourakia nistissima, the Lenten cakes often made by children especially for this day.